Absorbed into the colourful world of its central character is a racing game where children learn the alphabet to progress. 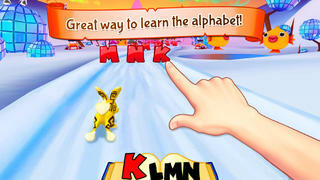 As the Wonder Bunny ABC Race game shows the next letter to tap, the game is more about learning the alphabet than testing understanding, but the repetition in doing this makes it effective. It's Wonder Bunny time! 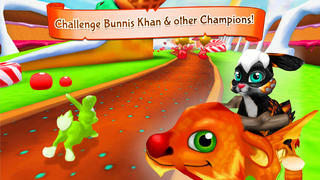 Join Wonder Bunny and his cute friends as they explore a fun-filled race for carrots! Wonder Bunny ABC Race is an entertaining and captivating learning game, which introduces your child to the fundamental concepts behind the English alphabet. It’s time for Wonder Bunny ABC Race; Ready, Steady, Go! 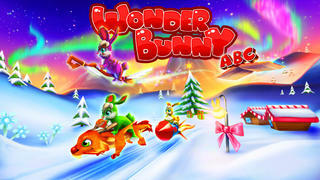 The star of Wonder Bunny ABC Race is a cute bunny and his friends. They love carrots, as all bunnies do, and they are racing to get more carrots. But there are funny surprises and alphabet related challenges on the race tracks. Can you help your pet bunny navigate through the race track and win massive loads of carrots? 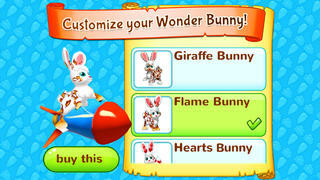 Customize your favorite Bunny, and get ready for a fun action packed adventure! *Child-friendly, easy to play interface: all you need to do is to tap! *Cute, colorful and cartoonish game environment, with lots of fun tasks! 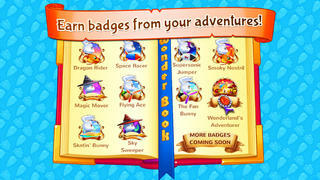 *Play in beautiful Candyland and magical Polar Heroes game worlds!